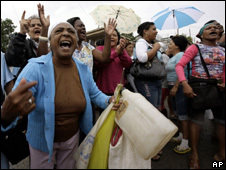 Cuban police have detained wives and mothers of political dissidents at a demonstration in the capital, Havana. About 30 members of the "Ladies in White" were stopped as they marched alongside the mother of a prisoner who died last month after a hunger strike. They were demanding the release of some 50 government critics who are still being held after mass arrests in 2003. The BBC understands that most of the women detained in Havana were released shortly afterwards. Orlando Zapata Tamayo was the first Cuban activist to starve himself to death in protest in nearly 40 years. The case of Zapata, declared a prisoner of conscience by Amnesty International, drew international condemnation and calls for the immediate release of all Cuba's detained dissidents. Cuba's authorities have gone on the offensive, both at home and abroad, since the international outcry, the BBC's Michael Voss reports from Havana. 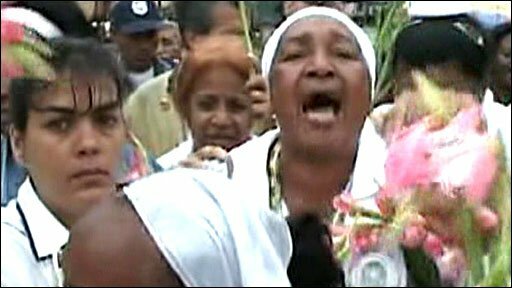 Wednesday's protest was the third held this week by the Ladies in White (Las Damas de Blanca) to mark the anniversary of the crackdown in the one-party Communist state seven years ago. The women were heckled by hundreds of government supporters as they left a church in the Parraga neighbourhood with Reyna Luisa Tamayo, who alleges that her son was tortured in jail and that his death amounted to premeditated murder. Police officers and interior ministry agents later asked the women to end their march and take shelter in two government buses. After they repeatedly refused, several female officers moved in and put them on to the buses by force. The Cuban government describes the dissidents as common criminals who were paid by the US to destabilise the country. Thursday is the anniversary of the mass arrests in 2003, our correspondent notes. The majority of those detained remain behind bars. The anniversary would probably have passed unnoticed but for the death of Zapata, he adds. When the European Parliament voted last week to condemn his death, Cuba responded by launching a counter attack on the EU. Highly critical articles have appeared on the front page of the official newspaper Granma almost every day since then. Police brutality in Europe was the latest headline, while racism, unemployment and poverty in Europe were others, our correspondent says. The EU had pushed for a policy of engagement and dialogue with the communist-run island, in contrast to the US trade embargo. For the moment that approach appears to have run into a brick wall, our correspondent says.